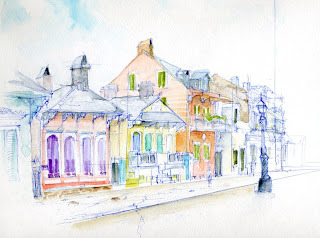 Sketch of row houses in the French Quarter of New Orleans. Although this is a sketch from the street what you are looking at is the back of homes built around a central courtyard which is the opposite of our neighborhoods. The arrangement allows for better privacy. Between each house is a locked gate, usually ornamental iron, the fleur-de-lis is the standard emblem of New Orleans used for ornamentation everywhere. There were quite a number of abandoned homes and buildings but many were being renovated. Being so old and built on marginal foundations, square and plumb is not a feature of these homes and buildings. I got the impression there were real estate deals to be had whether a commercial building or residence. I was told that 70% of the population in this area has not returned after Katrina and that downtown and surrounding quarters have yet to be renovated. Many high rises were vandalized and have yet to be repaired or razed as the case may be but people such as Donald Trump have staked out sites for new construction. Music is everywhere especially the French Quarter and Bourbon street. 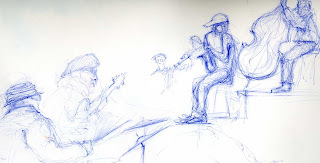 Whether a formal club or tavern or just street musicians the place Rocks. We danced to Zydeco at the Rock and Bowl, a 50's vintage Bowling alley where the entire family including grandma and grandpa, danced or rather 'two stepped' the night away. I sketched this little drawing while eating a mess of Crawfish at the French Quarter Farmer's Market. It seemed every musician lives to play. The quality of music was exceptional whether it was a brass band playing ragtime or a piano player in a lounge. Zydeco was my favorite which differs from Cajun in that it is largely associated with the Creole (black) culture as opposed to the Cajun (white) culture. Betts and I rented a car and drove down the Gulf Coast with the intention of dining in Lafayette at Mullate's, famous for Cajun food and music but only made it as far as Avery Island where TABASCO is manufactured. It is an extraordinary place where they not only make my favorite chilli sauce (700,00 bottles a day) but the McIllheney family started a Snowy Egret Sanctuary to help save the endangered Egret back in the mid 1800's. It was a success and today there are hundreds of Snowy Egrets as well as herons, Ibis and ducks that roost on bamboo warfs. I particularly liked the huge live oaks from which moss hung. It's a place I would love to spend time painting with my oils. The colors are wonderful but the mixture of vines wrapped around everything, moss hanging like beaded curtains, the blooming azalias and exotic palmeto fronds are so wonderful I could spend months painting and never run out of new subjects. I discovered the Cajun artist Rodrigue http://www.georgerodrigue.com/ at the New Orleans Museum of Art. Creator of the 'Blue Dog' otherwise known as the 'Loop Garoo" a childrens tale, told to make kids behave (you better behave or the 'Loop Garoo" will get you). Rodrigue is wildly successful which goes to prove that art is about expression and that among the wide panoply to choose from, art is truly in the eye of the beholder. A huge market has been created around his art, especially the 'Blue Dog'. His technique is marginal but his vision is exceptional. 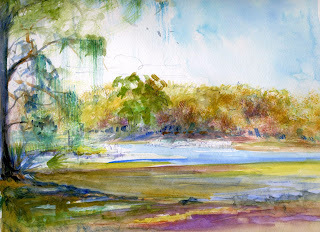 He paints about what he knows and the Cajun culture that he was raised in. He is the pictoral spokesman for the Cajun culture. Very regional and native son made good. I look forward to returning some day. Enjoy Jambalya, Fille Gumbo, Etoufe' and crawfish and maybe even learn to play Zydeco or atleast dance the two step.